I don’t usually put photos of myself on here but when I do, they’re my grossest ones. Here’s one sweaty mess with hands double their normal size, the aftermath of 35km running in the bush. You’re welcome. 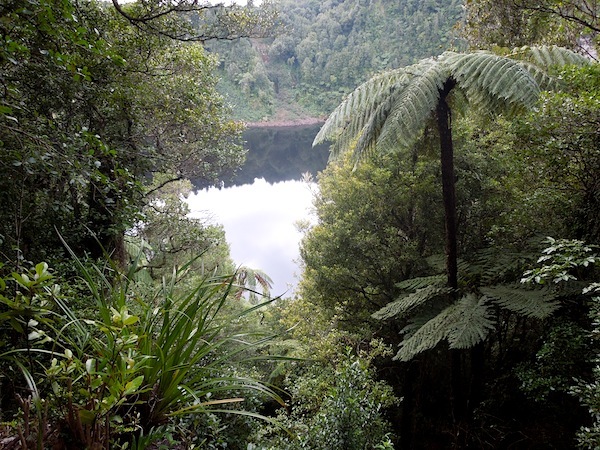 On May 26, the fourth anniversary of my arrival in New Zealand, I ran my little heart out in the bush in Rotorua. A whole 35km later, with lots of steep hills in those, I crossed the finish line of the longest, toughest, and most important running event I’ve entered to date. In the two months we had to train, since the day Stacey emailed me and twisted my arm about signing up for this run, we never reached the distance we had to run that Saturday, on our first long distance trail running event. We had gotten as far as 22km in the Waitakeres one Sunday morning by ourselves, and that ended up being followed by a long afternoon nap to recover from it. Fast-forward a few weeks of half-arsed attempts at hill climbs and long runs and there we were, just before 9am near Lake Okataina in Rotorua, with the cold temperatures used as an excuse for the trembling when what was really making us shake was the nerves and stress and the feeling of OMG what-the-hell-are-we-about-to-do. We left work early on Friday to avoid rush-hour traffic during the three hour drive to Rotorua. I decided not to run any risks and even dinner was exactly the same thing I have eaten before every major running event (beef ravioli and nearly a whole chocolate log for myself because if I’ve got an excuse to carb-load, I go for gold). I laid out my clothes for the next day, prepared the backpack that I was going to carry with me during the run and the bag with the extra stuff I needed C. to keep with him for the two times I knew I was going to run past him. I went to bed early (well, 10:30, early by my standards). And then I slept like crap, of course, with the pre-run stress-related stomach aches making the usual appearance. At 9am that day, after following a training plan that was only about as long as Kim Kardashian’s marriage, we had no choice but to start running. And so we ran. And it wasn’t long before the climb was so steep that it started defeating us and forcing us to walk more than run. But it was all okay, we were doing it. Reading about trail running had taught us that walking up some hills was a smart, effective way of conserving energy. When you are about to run 35km and have no idea how that’s going to go, conserving energy is pretty high priority. pretty views helped. crater lakes make me happy. I had once read an interview with Mal Law where he said that one of the secrets for long-distance running was to break it down in your head. 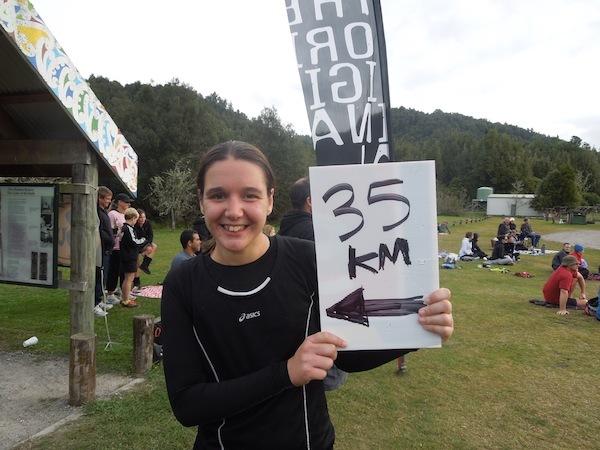 Out there on that day, I knew my little brain couldn’t cope with the idea of running 35km. So I convinced myself that wasn’t what was going to happen. The course actually helped a lot with that. We passed our starting point twice in total, meaning we had two precious opportunities of seeing our “support crew”. I used those to reset my brain. The first 10km were, by far, the hardest, as it normally happens with me during a run anyway. It didn’t help that they were so incredibly steep (a 5km climb up to the trig and then back down, on a track that often felt more like fine sand than compact dirt). But, in my head, I was only running 10km. No biggie. The view from the trig was amazing enough to make me forget about the fact that my legs felt like they were on fire and, once we ran back down, we had 10km ticked off and “only” 25km to go. 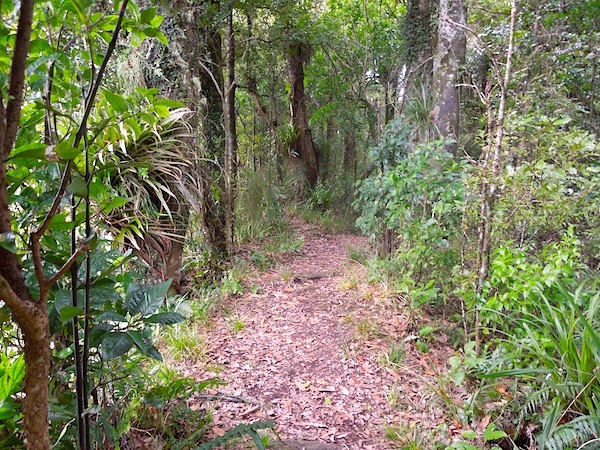 The following 6km, though, were out on a track in and out of the bush (3km each way), back to the starting point. So I told myself I was only going to run another 6km. Again, no biggie, had done it plenty of times before. During those 6km, we had to make a couple of stops, one of them to crack out the first aid kit and plaster the hell out of the only blister I got during the run (a victory in itself, if you ask me, since I was expecting to have at least both legs amputated). Those 6km weren’t as steep as the first 10km but still had challenging bits. We stayed in a good mood for way longer than I’d expected, though, and by the time we had reached 16km in total, we were back at the start point for the final stop near our lovely supporters (who did a wonderful job of being there at the right times to feed us while stopping themselves from dying of boredom in the process). We stopped for food, water and a bit of a stretch and then it was off into the bush for the final 19km on our own. I tried to hit the ‘reset’ button in my mind again and forget about the previous 16km. I was going for a 19km run, something I’d done before too. The fact that I had just ran 16 other kilometers had to be quickly forgotten. we’re not running uphill! yay! I felt better at the start of those 19km than I had expected to. Adrenaline is a wonderful fuel. Adrenaline, jelly beans, chocolates, Gu shots, salt & vinegar chips, water, coca-cola… Between what I had packed and the wonderful job the organizers did with the aid stations, I had more than enough resources for hours worth of a very high sugar high. In fact, about 22km into the run, in a section where we got off a bush track and into another by crossing a road, Chris and a couple of friends happened to drive past, right when I was stopped (for probably too long) at an amazingly-stocked aid station. They described me as being on some sort of high, jumping up and down in excitement and offering them jelly beans and jet planes. The sugar high lasted a few more kilometers but, of course, I eventually crashed. no blue sky. but also, no rain. win! The final 7 or 8km were one sluggish descent into madness. I was physically exhausted but it was the mental exhaustion that was making every step harder to take. I saw trees changing shapes (all part of the famous runners’ high, as I later found) and even talked to myself out loud to keep myself from stopping. The range of emotions out on that trail was far too wide to properly put into words. Physical pain, which had been my biggest worry, turned out to actually be the least of my problems. With about 3km to go, I stopped seeing the arrows marking the track and convinced myself that I’d taken a wrong turn and was horribly lost in the bush and would probably never be found again. When you’re that tired, getting that desperate and silly is not that hard. My brain wasn’t up for rational thinking anymore and emotions were in full control. pretty new zealand is pretty. I ran and ran and ran and tried telling myself that no, of course I wasn’t just getting further into the bush and away from everyone else. After a few minutes (could have been a few seconds, felt like a few hours), I spotted a runner disappearing into the distance. I wasn’t lost after all. I ran faster to catch up and, as I got closer, the runner smiled and told me “we’re almost home”. Not long after that, there it was – a sign saying we had only 1km to go. The final kilometer that, of course, felt like a whole marathon. I reached the grass area that I knew was part of the park where it was all going to end but it took me a while to spot the finish line. When I eventually did, I didn’t hold back the tears. Screw pride, I was freaking knackered. But I was done. Holy crap, I was done. I crossed the finish line to proud familiar faces who couldn’t care less about my sweaty mess and hugged me anyway. One of the organizers saw me crying and told me I should sit down. I told him I was okay, just really happy to have finished. The free sausage sizzle (kiwi-style prize, as it should be) tasted like the most exquisite meal in the world. As I started cooling down, my pride was really the only thing that wasn’t hurting. I was incredibly happy to have done it in such a beautiful place too. 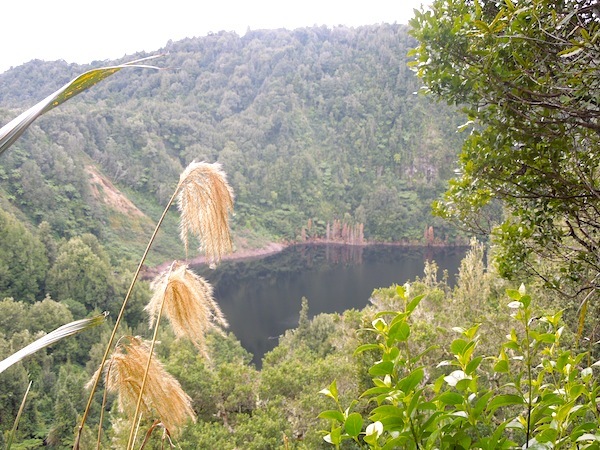 The bush near Lake Okataina is beautiful and reading up on the Okataina volcanic centre showed me it’s also quite a special place. That run was the perfect way to celebrate my fourth kiwi anniversary: challenging, hard as hell at times, pretty enjoyable for most of it, and rewarding like few other things I’ve done before. 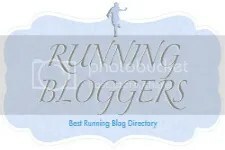 Categories: running | Tags: fitness, healthy-living, new zealand, running, sports, the big o trail run, trail running | Permalink. Ah bolas! E queria dizer aquilo na língua de Camões! O raio do habito de falar inglês! what an incredible achievement. Good on you for finishing. I’ve talked myself into doing the Melbourne Half Marathon – a super fit, triathlete friend has challenged me to finish the Half before he finishes the Marathon! I’m a sucker for challenges! My favorite place in the WORLD! 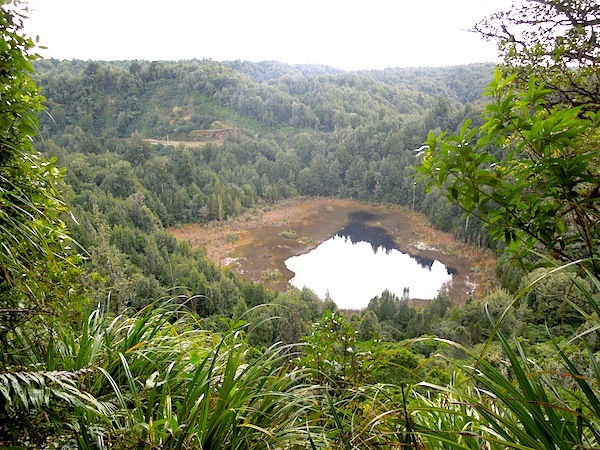 Lake Tarawera is where my family have holiday’d for years, very near Okataina. Oh it makes me so nostalgic to see these photos – would LOVE to be trail running in that area again! 35km is crazy. You are crazy. But amazing. I’m VERY impressed.